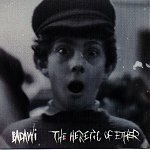 With a spiritual upbringing and mindset, Reuel "Raz" Mesinai, better known as Badawi, takes a giant leap on THE HERETIC OF ETHER. Not only does he conceptualize every color, every movement and every thought he sees or thinks, but he transforms all these elements in to a musical composition that is intricate and intriguing. Using Erich Schoen-Rene on cello, Ralph Farris on violin, and contributing a voice, the keyboards, and the percussion work himself, Badawi travels the desert lands in search of a the shape that will fit his sound. Unique, and undoubtedly his own, the sounds he creates are trickle through your head, creating images like an acid trip, but without the bad effects. Listening to his album is truly an out of body experience. Set up in chapters, Badawi takes a different approach to everything pertaining to the disc. Conventionalism seems to be out of the question, as he searches for himself through his music. Out of the ordinary, and highly confusing (which is the beauty of the music), you won't be able to put your finger on anything here -- but you'll still come back. I'll give it a B.